More than 100 vintage guitars were on display at Leipers Creek Gallery, including Clarence White’s original “string-bender” Tele (now owned by Marty Stuart), Johnny Cash’s black Ferrington, the first Stratocaster ever made (the prototype), a set of 1924 Gibson Lloyd Loar instruments, Eric Clapton’s 1958 Gibson Explorer, and bunches of pre-war Martins, ’59 Les Pauls, and just about every collectable guitar you’ve ever heard of. But for those who weren’t guitar nuts (pardon the pun), the real attraction was the music made by some of the world’s best guitar players, including Larry Carlton, Robben Ford, Rick Vito, and Reggie Young. I wouldn’t have missed it for the world, but I was pleasantly surprised to be invited by Reggie to sit in with him and his wife Jenny. Reggie played the electric sitar on “Cry Like A Baby,” our second hit with the Box Tops, written by Dan Penn and Spooner Oldham. If you don’t know who Reggie Young is, you should. He has played more “signature licks” and unforgettable intros than any other guitarist in history. Remember the intro lick to Dusty Springfield’s “Son of a Preacher Man”? Dobie Gray’s “Drift Away”? Elvis’s “Suspicious Minds”? Billy Swan’s “I Can Help”? Waylon Jennings, Willie Nelson, George Strait, Joe Tex, Wilson Pickett, Merle Haggard, Bob Dylan, Neil Diamond and countless others had Reggie on their records. He’s been a studio guitarist since the late ‘50s and he’s still at it. Reggie and his wife Jenny (a cellist) write and record incredibly beautiful instrumental music. Their latest recording “Be Still” is available on CDBaby. Which reminds me: Have you ever tried to write an instrumental? You should try it sometime. You have to have a strong melody to make it memorable. And try to invent a “signature lick” a la Reggie, for your song. What would Roy Orbison’s “Pretty Woman” be without that famous guitar lick? Anyway, I got to sing “Cry Like A Baby” with Reggie, Jenny, Richie Albright on snare, Charley “Chopper” Anderson on bass, and the other Memphis Boys legend, Bobby Wood, on keys. Carter Robinson sang beautifully on other Reggie-fied hits. In the same cool little store where we played (Serenite Maison), I had just met and played with Rebecca Correia, an immense young talent who completely blew me away. Check her out, too. That young lady knows how to write a song. But I digress. While we were playing, across the street at Puckett’s, a great jazz group featuring guitarists Andy Reese and Mel Deal were astounding guitar aficionados with their nimble fingers. As all this great music was being played, the rain was pouring, wind was howling, bridges were washing out and it became impossible to get in or out of historic Leipers Fork. Many of the artists scheduled for the evening show, including Rick Vito and Bugs Henderson, couldn’t get there. Highways flooded and flights were cancelled. Tornadoes were touching down now, and everybody was herded into the basement of the Country Boy restaurant until the tornado hop-scotched off in another direction. Now cars that were parked at the bottom of the hill were floating away. The good news was that Larry Carlton and Robben Ford were still scheduled to play. The outdoor concert was moved to the Rec Center. It was only three blocks away, but after walking there in the deluge, I might as well have fallen in the river. I had completely forgotten how heavy wet blue jeans are. As I squished into the Rec Center, the music coming from the stage made me forget how wet and cold I was. At first, I thought they were playing Segovia or Julian Bream CDs while they set up the backline or something, but when I looked closer, I saw what appeared to be a teenage girl playing with such depth of feeling and technical virtuosity that I could hardly believe my eyes and ears. Her name’s Virginia Luque. She is from Spain and is evidently not a teenager. You absolutely must check her out at virginialuque.com. Which reminds me to recommend this to readers: you should listen to all kinds of music! You’re going to have your favorites, but try to branch out and expand your ears and mind by spending a little time in other musical genres. The great Ladd Smith was next on stage. Another extremely talented guy, you can check him out at laddsmith.com. I had to go rescue my car and guitars and move them to higher ground, so I missed Guthrie Trapp (guthrietrapp.com). 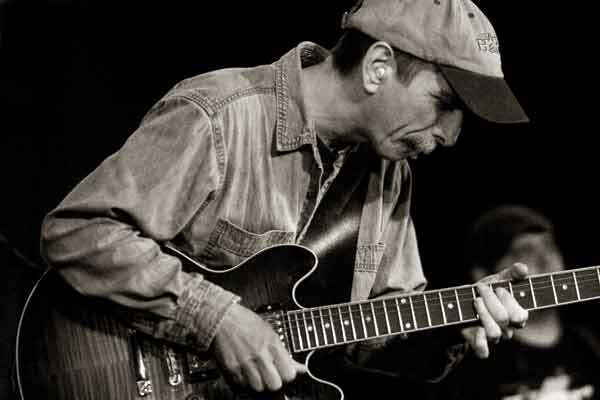 When I got back to the Rec Center, the absolutely unbelievable Jack Pearson was playing with Larry Carlton and Robben Ford, two of the best guitarists on the planet. Their respect for Jack (perhaps the world’s best relatively unknown player) was obvious. Every time he took a solo, their faces lit up like a kid at Christmas. Mine, too. Gary Talley is the original guitarist for Grammy-nominated group, The Box Tops. He’s toured and recorded with Willie Nelson, Billy Preston, Waylon Jennings and more. His video/DVD Guitar Playing for Songwriters is made especially for songwriters.